A loan of $375 helped to purchase nutrition-rich fodder for the buffalo. Rukhsana Parveen is a woman aged 24 who lives with her family in a small village. She owns a few buffaloes and sells their milk in the town to earn her living. She has been following old and traditional ways of managing buffaloes, resulting in a gradual decrease in production of milk. 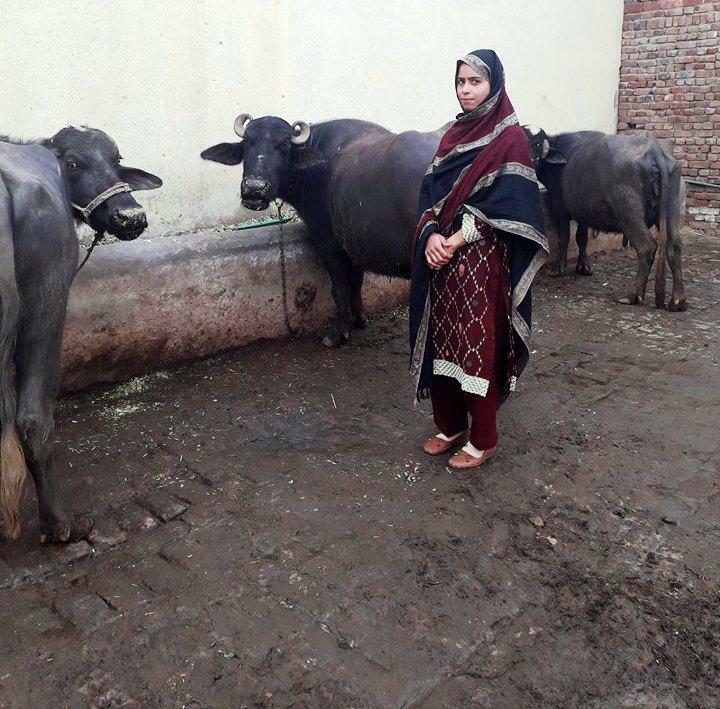 Along with her father, she consulted a local veterinary officer and he recommended adopting nutrition-rich fodder for buffaloes for improving milk production. She therefore has applied for a loan to purchase nutrition-rich fodder for the buffalo. She is hopeful that this will be helpful in raising the milk production. She is thankful to Kiva and JWS Pakistan. It helps women entrepreneurs grow their small businesses. This loan will be used to provide working capital loans to low income women micro-entrepreneurs, enabling them to pursue business opportunities and improve their livelihoods. By supporting this loan you are helping deepen financial access for women entrepreneurs that have difficulties accessing financing from traditional financial sources. In Pakistan, 58.7 million people earn less than $1.25 per day. Poverty is widespread in the country and is predominantly a rural phenomenon. Jinnah Welfare Society (JWS) is a non-profit social development organization that aims to increase the income of impoverished rural communities by delivering cost effective financial services. JWS Pakistan's mission is to uplift the status of marginalized communities through an integrated approach that helps sustain businesses and improve living standards. Why Kiva works with JWS Pakistan: Kiva supports JWS Pakistan’s strategy to help small farmers improve their quality of life through an integrated system of financing and training. JWS has had to limit the growth of its agricultural loan product because of the costs associated with providing farmers with holistic services. Kiva funding helps JWS grow the program significantly.